This topic contains 19 replies, has 2 voices, and was last updated by garwaf 4 months, 2 weeks ago. In the future devastated world of Eden, life is is harsh for what is left of mankind. A portion of it now lives in underground shelters ruled by an almighty A.I., but it’s a boring life for many, especially the youth. The most talented pilot students in robotics clandestinely gather around improvised arenas and compete to determine who’s the best bot Pilot. 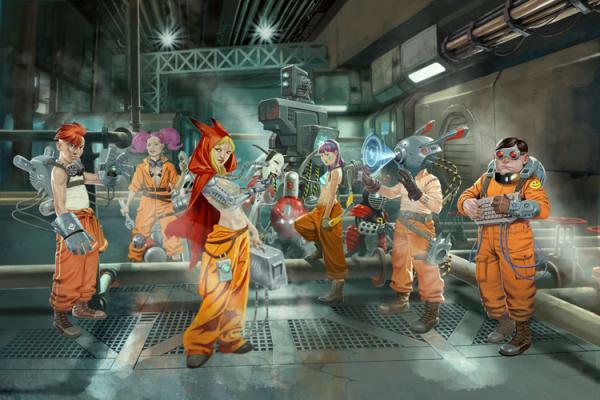 Surrounded by a team of 6 bots, each pilot attempts to dominate the arena. See you soon on Kickstarter. This topic was modified 5 months, 2 weeks ago by garwaf. This topic was modified 5 months ago by garwaf. This topic was modified 4 months, 3 weeks ago by garwaf. We recently added “Overview” and “Let’s Play” videos. Your feedback is welcome ! You can add comments in the KS. This reply was modified 5 months, 2 weeks ago by garwaf. The rulebooks are available to download! (PDF). 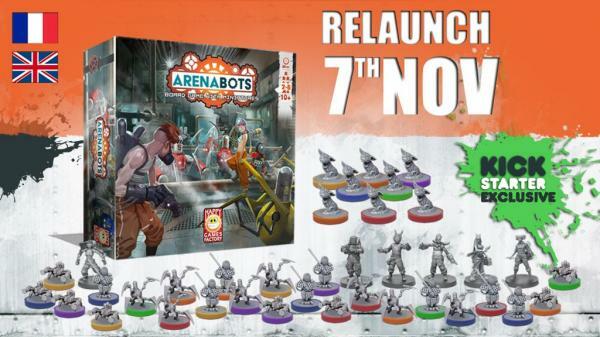 Now you can have a more accurate picture of what arenabots has for you! This is of course not the final version you will have in your box, but you can see more precisely how the game works. 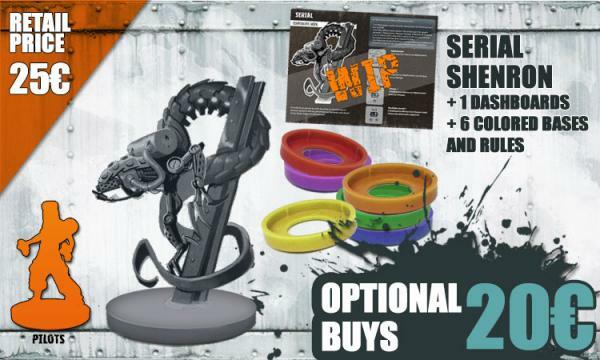 New Stretch Goal! 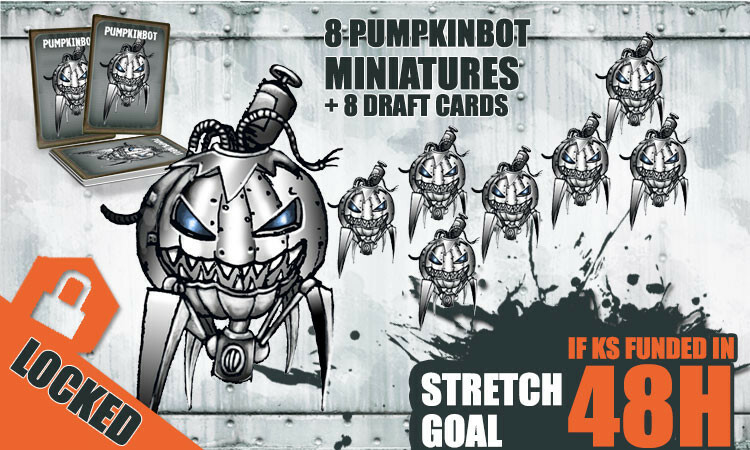 Following a Facebook poll for Halloween, the concept that won the most votes will become an extra Bot if the KS is funded in 48 H! It starts in a few hours! Now it’s coming for real! Be among the the firsts to support us and access the early birds 48 h! 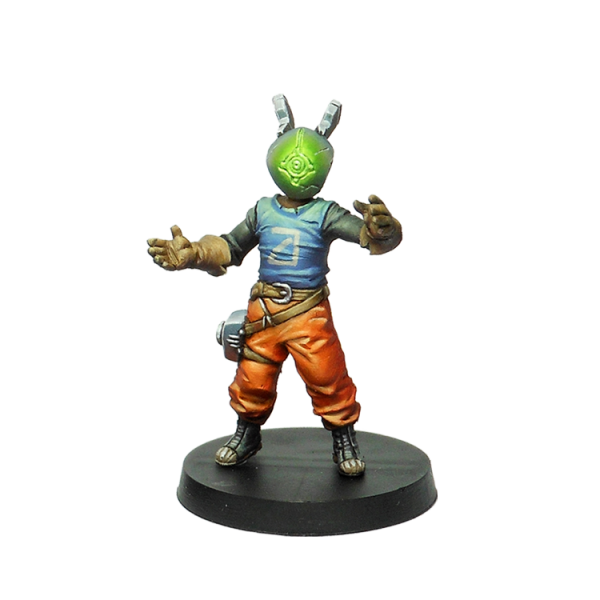 And do not forget that there will be an exclusive PumpkinBot figurine if the project is funded during these 48 H.
If you want this project to be a success, if tou want to compete with your friends for the title of Master of the Arena, spread the news as much as you can! Thank you ! This reply was modified 5 months, 1 week ago by garwaf. 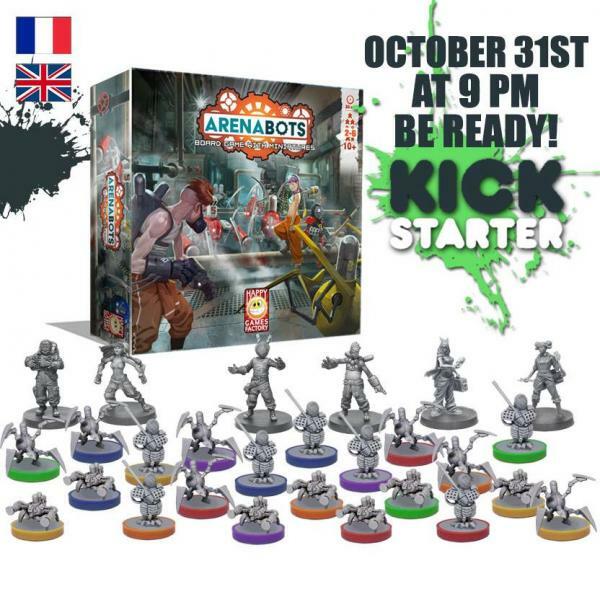 Hello everyone, and thanks to the very first KS backers of ArenaBots, as well as to those who put energy to promote the campaign! 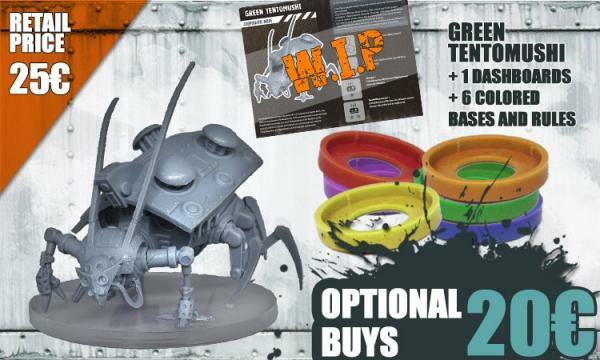 It is thanks to you that the game will become reality, and that we will be able to hear the sound of a cheering crowd mingle with the din of Bots in action! (Yes I know… but I like this game). 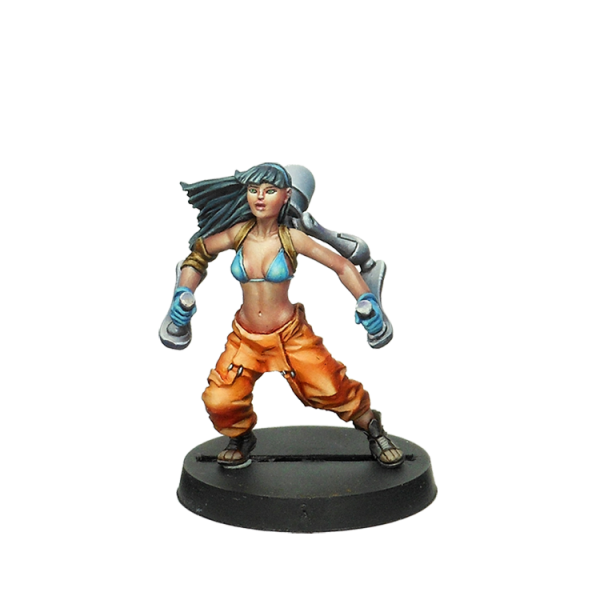 Let me introduce the fearsome Carmin Hadakauma! The Hadakauma is an ISC bot instructed to roam the outside world. His efficient design allows him to range quickly the wasted lands. This one is quite unusual. He isn’t entierly disconnected from NOAH, the main AI of the ISC, but he has developed his own form of autonomous mind. To the ISC, it’s a malfunction. He is regarded as unfit to fulfil his mission and needs to be recycled. 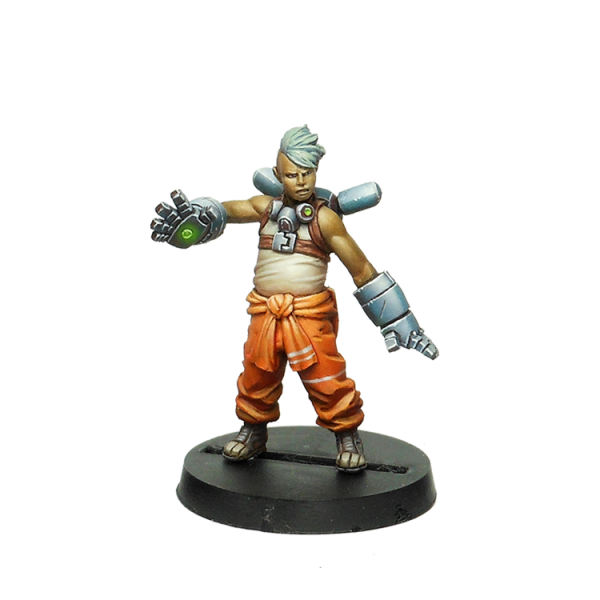 Hidden in the undergound slums, he takes part in the ArenaBots fights, where he proves to be an exceptional challenger. 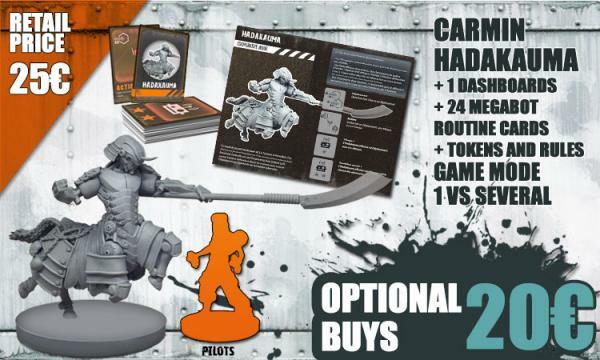 The Carmin Hadakauma brings a new exciting way of playing ArenaBots! A player assume the control of this fantastic mechanical beast, and struggle fiercely angainst all the others. The Carmin Hadakauma may be alone, but he isn’t defenceless at all. It could be a big mistake to think he is the prey. The miniature is an update version of the one from the skirmish game EDEN. The scuptor is Victor Aguilar. You can follow his wonderful work on his Facebook page: https://www.facebook.com/profile.php?id=803385214. And now, the dreadful Serial Shenron! The Serial 5#3N20N is originally designed for maintenance and cleaning by incinération. His snake shape is fit to reach every nook and corner. He’s very dangerous since, in his working area, anything — or anybody — is considered a waste that should be eliminated. Once captured and disconnected from NOAH, the Serial Shenron’s ferocity has been hijacked to be used into the arena. The highly inflammable chemical liquids in his tanks have been replaced by volatile electromagnetic substances. With such a size and power, he’s a partner of choice in the arena. Adding the Serial Shenron, the fight becomes even more spectacular! Place the Serial Shenron at the center of the arena. He isn’t activated at the of the game. The pilot who will hack him will become the bane of the others, since he will be in possession of an incredible destruction engine ! 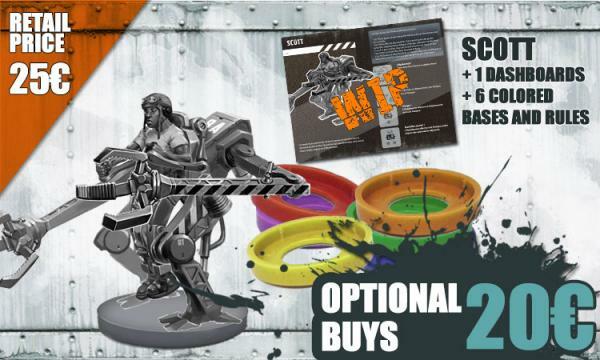 We were asked for a pledge combining the core game and its stretch goals with add-ons. Good news, this pledge now exists! As you can see, it has been added to the KS page. As you can see when Scott prepares to enter the Arena, he makes a point of “dressing appropriately” for the occasion. We’ll tell you more about him soon! Benjamin is the Virus Master. He considers the bots’ mechanical aspect as a secondary thing. 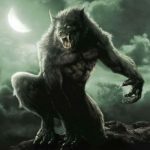 The computer systems are his main point of interest and in particular the way he can infect them to take control over. In order to do that, his deck countains some special routines, programs of his creation that others do not have access to. Level 1: Trojan Horse. Choose a Bot. It performs a hacking action on a target. If successful, a second target next to it is also connected. Replace its base with one of the pilot’s color too. 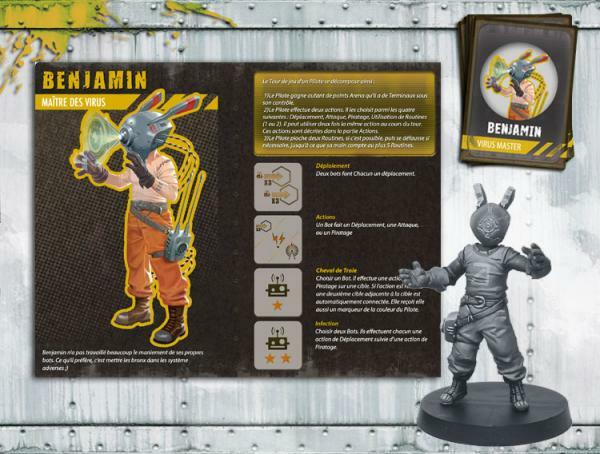 Facing Benjamin’s bots, the opponents will have to be cautious when leaving bots side by side. This routine can also be used as a “counter-hack”: if an opposing bot has taken control of one of Benjamin’s, by playing this he can regain his bot and in addtion take control of the bot that made the hack! Level 2: Infection. Choose two Bots. They each perform a Move action followed by a Hack. This routine allows Benjamin’s forces to spread like the flu in winter, or bacteria on a slice of pizza fallen on the floor, without allowing any time to react. He did not usurp his nickname of Virus Master! 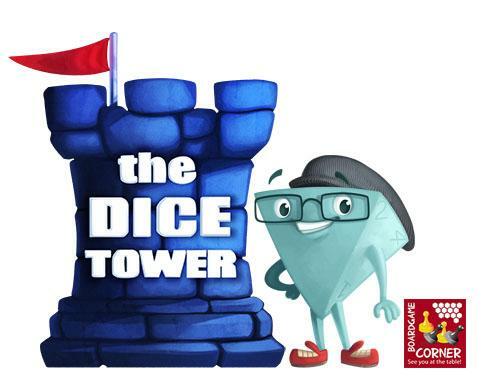 More about the game on KS. This reply was modified 5 months ago by garwaf. Unlike Benjamin, Tyra relies a lot on optimizing his bots. She thinks that there is always a way to boost mechanics a little more. Her assumption: if her bots are capable of feats to which opponents are unprepared, she has an advantage. Level 1: Boost. Choose a Bot. It performs a Move action followed by an Attack action. Boys of her age are often struck by the the young girl’s attractiveness, especially since she doesn’t particularly hide it, as if she had nothing to fear from anyone. In any case in the arena she’s kinda direct and straightforward and his opponents should not allow themselves to be distracted, otherwise it’s by a bot at full speed that they will be struck! Level 2: Destructive overload. Choose a Bot. It performs a Move action, then literally explodes: it attacks each item (Pilot, Bot) next to it. 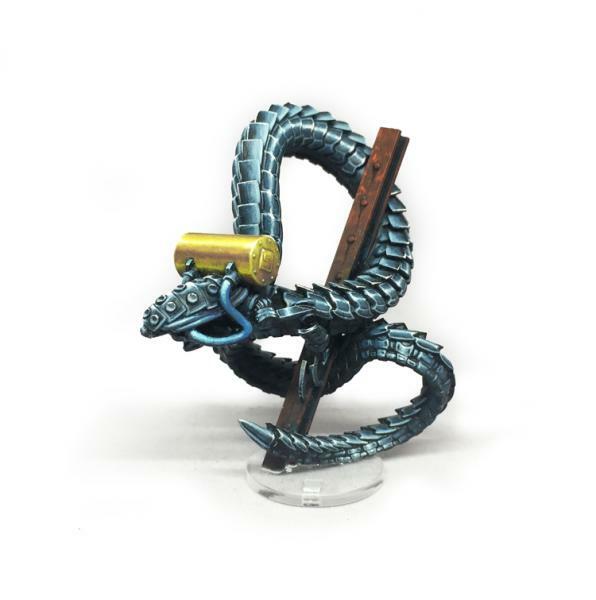 Then the Bot is out of order and his miniature is removed from the arena. This special attack cannot be reinforced nore defended from. Warning! Please handle with care! Sometimes it’s useful to push a bot far beyond its limits. This attack can be extremely powerful, however the price to pay is high and the operation deserves to be well calculated. Tyra, Benjamin and the others could argue about what’s most important in the arena between mechanics and programming skills. I think that Giuseppe would intervene to say “Do not forget the Pilot”. He would say that control makes the difference. Level 1: Theater. Choose two Bots. One after the other, they perform one of the following actions: Attack, Move or Hack. 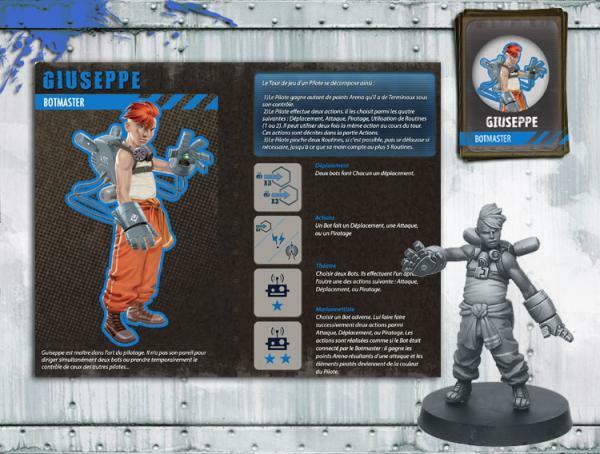 Giuseppe sees the arena as a scene where he must create the show. The admiring ovation of the audience, when he manages to combine the actions of two bots, is his first reward. The second reward is of course the advantage he gains onto his opponents. Level 2: Puppeteer. Choose an opposing Bot. This Bot performs two actions among Attack, Move or hack. 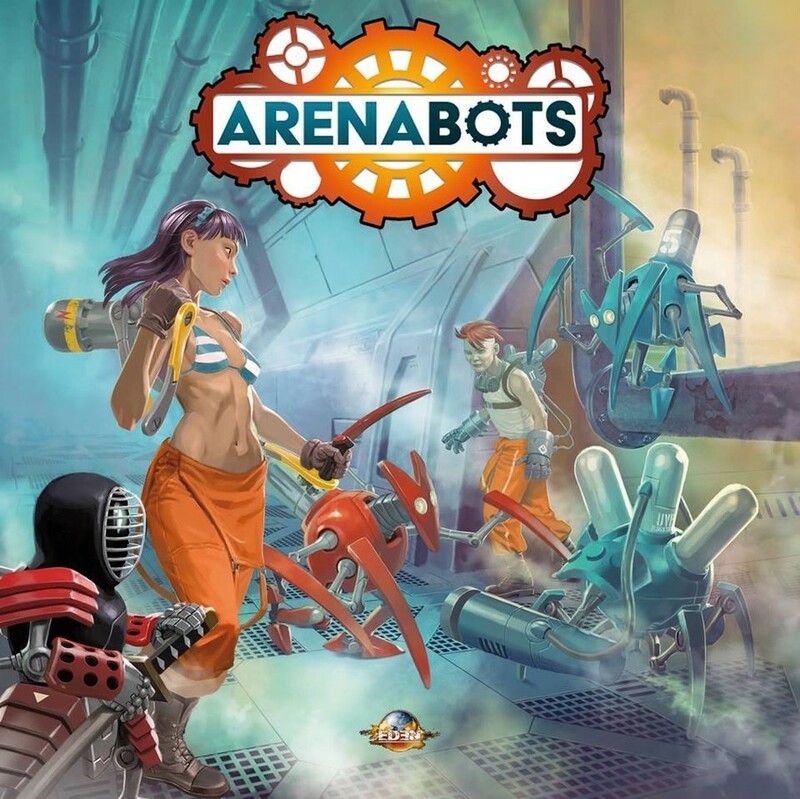 The actions are performed as if the Bot was connected to the Botmaster: he gains Arena points from attacks and the hacked items are converted to his color. Even more spectacular than controlling one of your bots to perfection: to do the same when manipulating one of those of the opponent! It’s a way of asserting his superiority in the field. This routine allows you to perform an action that earns points while disrupting the plans of the real owner of the bot. 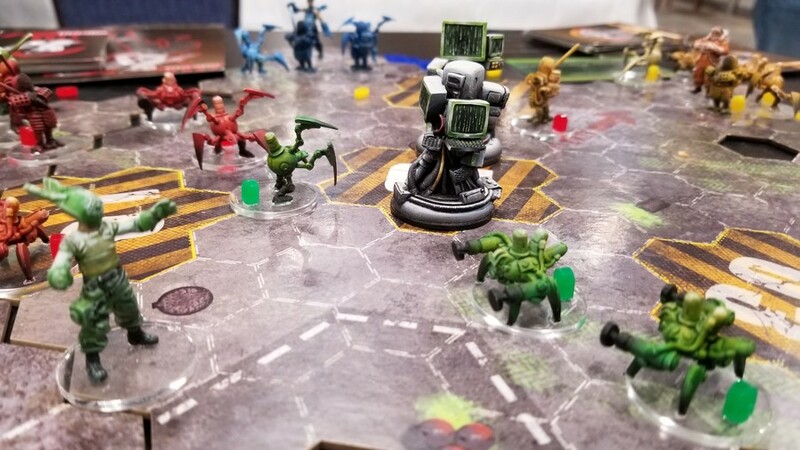 Even if this control last no more than a turn, it allows an often unexpected action, like attacking a pilot who thought himself safe or to take a less temporary control of a bot in the middle of his team! A new add-on has been unveiled! In the closed environment of their underground shelter, it’s quite unusual for young pilots to meet for the first time in the arena. However, Rouge seems to have appeared from nowhere. She may be inconspicuous by nature, but she became the topic of a lot of questions. How did she get there? In what circumstances did she lose an arm? Could it be that she went to the outside and, as some people suspect, came from another shelter? Level 1: Sneak attack. A Bot performs a Move action, followed by an Attack that can’t be defended. 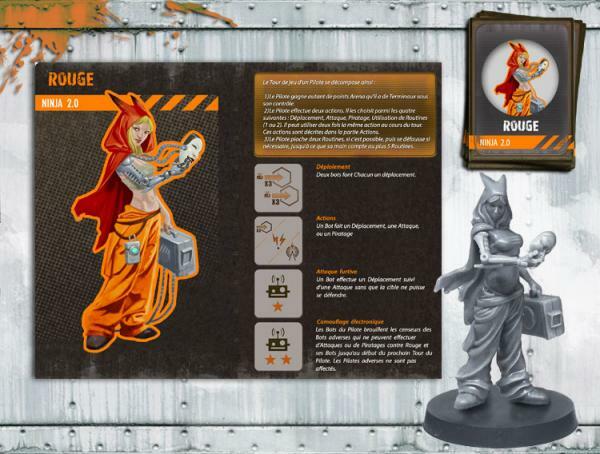 She’s called Rouge, but her way of carrying out attacks might evoke a rogue. An attack has a fifty-fifty chance of of being successful. Therefore, forbiding the opponent from asking a re-roll, while having the right to do it yourself — by discarding routine cards — significantly increases the chances of achieving your ends. Level 2: Shadow puppets. The Pilot’s Bots jam opponents’ Bots’ censors. Rouge and her bots can’t be the target of Attack or Hack from opponents’ bots until her next Turn. She’s not protected from Pilots. Rouge is no longer a little girl, she’s not afraid of the big bad WolfBot, nor of any Bot. But sometimes it’s better to be unnoticed and let others fight among themselves! This routine doesn’t fully protect since it doesn’t affect the drivers and doesn’t protect terminals. It’s still an excellent protection, especially useful to play soon after exposing yourself. Igor is the hacker exemplar. It seems that no system, no matter what nor where it is, can remain impenetrable to him. Nothing motivates him more than to confront his skills and his mind to new défensive barriers. Nothing can be more fun than surprising the opponent with a hack he didn’t expect. Level 1: Flash hacking. Choose a Bot. It performs a Move action followed by a Hack. Hacking a bot doesn’t immediately earn Arena points, but it’s easier to do than an attack and it allows you to gain the upper hand over the opponents. In addition, the target can also be a terminal. Note that used on an SpiderBot, this routine allows you to reach almost anything! Level 2: Anonymous. 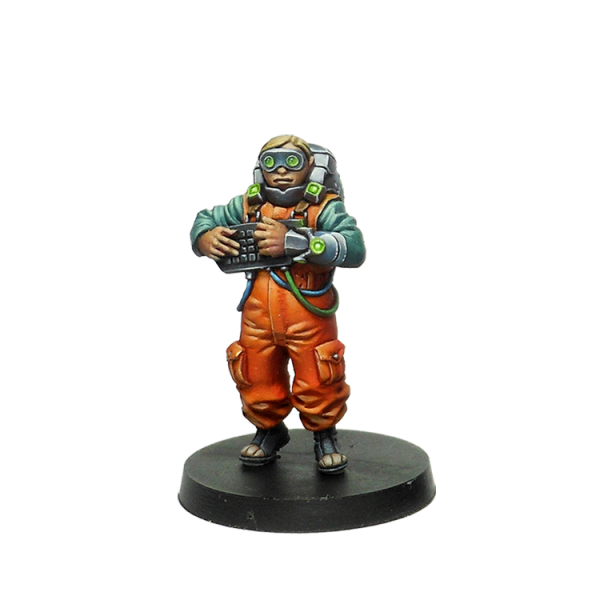 The Pilot uses his own systems to perform two Hacks on any Bot or Terminal in the arena. These hacks must be performed on two different targets. No bot or terminal is immune to Igor’s skills. Being able to access any component wherever it is and hack it, it’s certainly the absolute hacker’s dream!